Since the 1990’s Avenues has helped thousands of people to find their future partners through a professional matchmaking service. Avenues is one of the longest established and most successful off line personal introductions dating agencies in the UK. 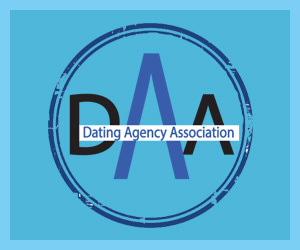 In more recent times we have recognised that more and more people are single later in life and do not find online dating either a comfortable or sufficiently safe way of meeting other unattached people for a potential relationship. We also appreciate that in today’s world people continue to be active and forward looking for many years beyond the age of fifty and are not prepared to settle for a single life when they know they would be more content if they shared their life with a partner. Therefore Avenues Dating has more recently concentrated on offering a personal matchmaking service exclusively to clients who are over 50 years of age, developing expertise in matchmaking within this more mature singles group. We understand that our customers want a very secure, private and supported way of meeting other singles of a suitable calibre. Our matchmakers offer a very personal service, readily available on the telephone to discuss progress and the profiles of other clients that we have recommended to our members. Memberships with Avenues start from only £995, representing excellent value for a personal and professional matchmaking service. We have kept our fees at a similar level over the years as we understand that value for money when offered alongside excellent service is a winning formula for increasing our client base. Avenues members come from right across the UK. Our clients are from a broad range of business and professional backgrounds and share a common desire of wanting to find someone with whom that might share many wonderful moments together in their future years. Our team is led by Victoria Davis, who is Senior Membership Adviser at Avenues and our Senior Matchmaker is Alex Rollinson. Avenues is exclusive to the ‘Silver Surfers’ – people aged over 50. In terms of value it is quite simply the best priced national product that we know and represents excellent value for money. Even at such a great price, all members are interviewed, ID checked and vetted. Membership is for at least a full year and often longer. As an option – we still come to you and see you in your own home, where you are at your most comfortable. We cater for people aged 50-75, who prefer the safer, more cautious approach traditional personal introductions offers. 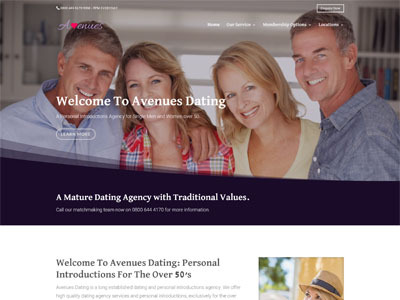 Avenues is one of the longest established and best known brands in the UK and since Online Dating has begun to dip in popularity, Avenues is a credible option for all of those daters who are aged over 50. Avenues is all about trust, surety and value for money, exclusively for that boom sector of the market – the over 50’s. Phone us today on 0800 644 4170 and we’d love to tell you how Avenues could be ‘the friend in the dating business’ that you have been searching for.